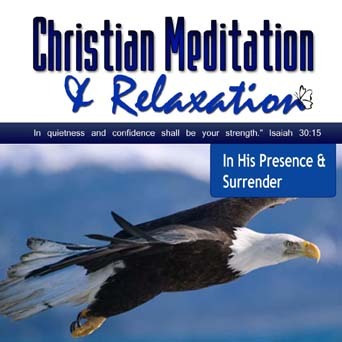 CD includes the two meditations, IN HIS PRESENCE and I SURRENDER. Each meditation begins with a progressive relaxation, followed by a Biblical narrative and relaxing background music. In this meditation you will visualize God’s glorious and healing light illuminating from the center of your heart, spreading through your extremities and expanding to those around you. Dwell in God’s presence and become one with Him, just as Jesus said, my Father and I are one. Receive God’s forgiveness and release any unconfessed sins that may be eroding your spirit and crippling your walk with God. Embrace that, in spite of your circumstances, Christ’s joy and peace is available to you everyday., Christ’s joy and peace is available to you everyday. Feel like you’re spinning your wheels? Nothing you seem to do is working out the way you planned? You feel like giving up, don’t you? Praise God! You are in a place of surrender, the place where you let go and let God. It’s time to stop and get still before God until you have clear direction and divine wisdom. Learn to wait patiently on the Lord to meet your needs and desires. Learn to stop seeking the answer and seek our Creator instead. He will make your crooked paths straight and guide you to inherit every promise, every hope, and every dream he has planted in your heart.